The sun is shining, the weather’s warm, and the drumbeats are beginning to echo across the islands. It is festival season, and Okinawans will be taking to the streets, fields, hills and stadiums over the coming five and one-half months to celebrate. Eisa, the popular and famous Okinawan folk dances begun originally centuries ago to entertain thespirits of ancestors as Buddhist invocational songs, will be performed literally in every village and town throughout the summer and early fall. Bright, colorful, and entertaining. That is Eisa. The costumes, the drumbeat, the magnetism of the event are sure to please even the most calloused husband being dragged along to the event. The Obon season, the Buddhist festival of the dead, is the time when Eisa is performed everywhere. Island Market will carry information of many of the events, but there are so many going on every week, one only has to look while driving down the road. Festivals are times to celebrate, and Okinawans do it well. It is like the carnival, State Fair and special event all wrapped into one. Visitors are not only welcome, they’re made to feel a special part of Okinawa’s friendly tradition. The 15th day of the 7th month of the lunar calendar is the heart of Eisa folk dance performances, but they’ll run from June through November. Songs for the dance originated from Eisa-omoro, songs praising Janamoi, who was responsible for bringing new culture from China in the 14th Century. Dancers and musicians, after sending off the spirits of their ancestors as they ended the lunar Obon festival of the deceased, would then parade through the streets with their large taiko and smaller paranku hand drums, making loud drumming noises. Although every community has at least one Eisa festival during the season, the largest of the festivals comes in early August in Naha. Billed as the 10,000 dancers festival, it is a sight to behold. The weeklong festival culminates with a couple major events, including the Shuri Cultural Festival, complete with traditional Okinawa costumes from the old Ryukyu Dynasty. The second is the day-long parade down Kokusaidori [Kokusai Street, known as International Street in downtown Naha]. Literally dozens and dozens of dance groups ranging from pre-school kids to professional adult teams will demonstrate their skills. 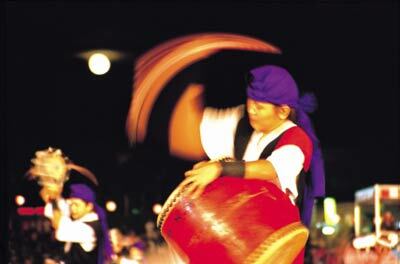 Obon, known as Bon Matsuri, will be celebrated July 13-16 in Okinawa. It is one of the best known Okinawa holidays, and many stores, shops and businesses will close as everyone takes time to honor their ancestors. This Buddhist-driven time of celebration will find everyone trying to go home,literally to their ancestral home districts, so they can pay homage to their families and to visit the graves of the deceased relatives. Okinawan custom and belief is that the deceased family members return to their early homes during Obon to make contact with living relatives. Foreigners will see Okinawans celebrating as a happy occasion, lighting torches and lanterns, and dancing and singing the Bon Odori dances.